Bank of Hysteria is a space for womxn, femmes, and gender nonconforming folks to express and validate their anger, something that they often find themselves unable to do, due to societal expectations, gender norms, or even fear of physical safety. I worked with Becca Milman, Malika Imhotep, Phyllis Thai, and Frances Thai on this project over the course of the Fall 2017 and Spring 2018 semesters. Considering how we might give form to this “arsenal of anger,” we played with the idea of offering women, femmes, and gender non-conforming folks “rage receipts” that would serve to validate their anger. The idea of the receipt grew into the metaphor of “investment,” ultimately leading us to conceptualize the form of a bank teller. In an early conversation about the project, our professor, Jill Miller, used the term “hysterical” in reference to the ways women’s anger is commonly dismissed. The social history of the term hysteria resonated with how we interpreted the need for this project. “Bank of Hysteria” was not only a feminist pun on a major banking establishment, but a way to connect our project to a larger discourse about the ways women, femmes, and gender non-conforming folks are systematically written off as “too emotional” to be taken seriously. To bring the Bank of Hysteria to life, we set up a Google Voice account for folks to talk about what they’re angry about, upset about, sad about, frustrated about, have rage about, or just want to talk about. The transcriptions of the voicemails and texts that came in became the crux of an interactive installation that was designed to resemble a bank teller window. 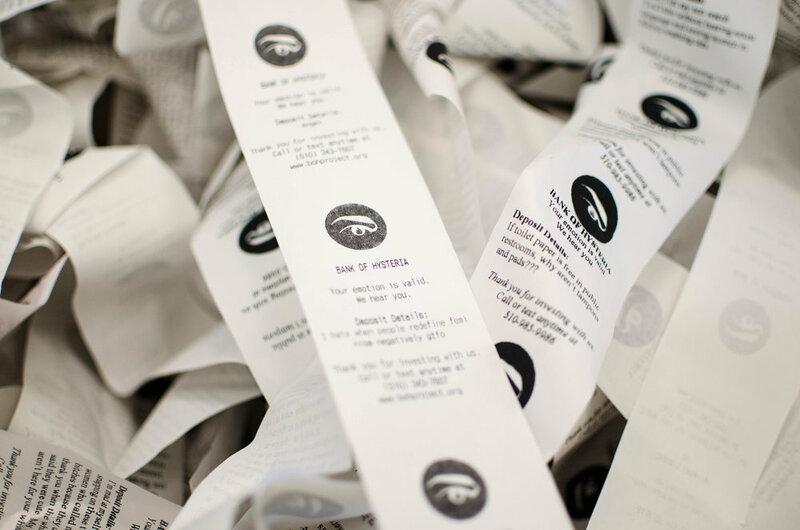 In this public installation, the transcriptions were printed out as “Rage Receipts” — creating a material representation of emotions that are valid and worthy of investment. This project brought together theory, critical design, and digital fabrication technology to effect change in the ways womxn’s anger is thought about. The members of our interdisciplinary team, with backgrounds that include computer science, cognitive science, African Diaspora studies, and Asian American/Asian Diaspora studies, all brought their full selves to the project, contributing to its markedly intersectional implementation. The research that informed this project came from the convergence of all these perspectives, as we pulled from sources in tech, design, psychology, socio-cultural analysis, and black feminism. This convergence of perspectives has led to an innovative form: the Bank of Hysteria’s design is grounded in a rigorous study of theory and historical and social contexts, while simultaneously drawing from contemporary digital fabrication tools and everyday terminology in its implementation and user interface. Our use of tools like laser-cutters allowed us to quickly and affordably prototype elements like the bank teller window and bank membership cards, while a simple thermal receipt printer allowed us to keep up with the flow of incoming messages. On the user side, our plays on the everyday language of personal banking provide entry points for folks to engage with the project and its larger meaning. Responses like these, and the many others joining them as “bank deposits” thus far, have given us new insights into the communities we aim to reach with the Bank of Hysteria, collectively creating a deep “arsenal of anger,” to use Audre Lorde’s term. As we continue to grow the project and create accompanying digital resources, we hope that our design’s low-cost form and low barriers for engagement will allow its impact to scale up — empowering broad communities of womxn, femmes, and gender non-conforming folks to invest in their own emotions and in the power of these feelings to drive change. Huge thanks to New Media 190 (Mitchell Karchemsky, Jill Miller, etc.) and Jacobs Institute for Design (Laura Mitchell, Roland Saekow, Amy Dinh, etc.) for their endless support! This project is currently being displayed at the CITRIS Tech Museum in Sutardja Dai Hall at UC Berkeley.